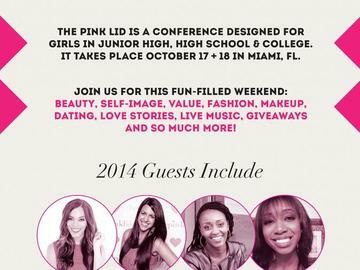 The Pink Lid is a conference in Miami, FL, designed for girls in junior high, high school and college. During this fun-filled weekend we have a FASHION SHOW, dance performances, live band, giveaways and speakers Alyssa Shull, DawnChere' Wilkerson, Emonne Markland, Sabrina Bixby and more. Plus, on Saturday night we will have, in concert, recording artist BECKAH SHAE. Girls who attend will make lasting friendships and learn LIFE-CHANGING lessons from the speakers and sessions over this 2-day conference event. Friday and Saturday are packed full of fun sessions, topics include: dating advice, love stories, true beauty, worth, value, fashion tips, open-panel (your questions answered) and much more. Also, we will feature a breakout session for youth leaders/workers.